This excellent documentary follows the lives of five different and totally diverse gay men and women in Israel who’s common link is the fact that they all hang out in Shushan, Jerusalem’s only gay bar. This is the one place where gays and lesbians of all nationalities, religions and social backgrounds can forget their differences for a few brief hours and hopefully have some fun. It’s not as easy as it may sound, as young Palestinians from the nearby city of Ramallah have to wait until the dead of night to scale the enormous Israeli security wall and risk life and limb just for a moment of relief in their normally sad closeted existences. 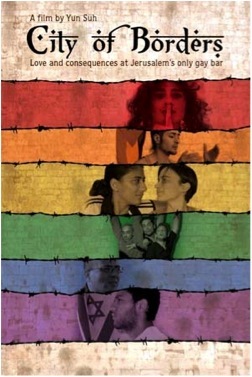 Through their heartbreaking and touching stories we see how deeply prejudiced and homophobic society is there ….. in both the Arab and Israeli communities …and how the newly formed Gay Pride Day caused such major controversy that shattered the fragile peace that these really brave gay souls had attempted to construct. The Middle East is a precarious enough Region for many people to achieve anything like a sense of normality to their daily lives, and for gay people it is considerably tougher. Superbly filmed and edited by American filmmaker Yun Suh, it made compelling viewing and I was totally engrossed to the very end to see how all their lives would survive and prosper.